Why not visit our Showroom in Cranage and view our wide range of flooring samples? Ashley is a family run business with over 20 years experience in the wooden flooring industry. We pride ourselves on supplying affordable flooring with exceptional customer service. Ashley has its own team of knowledgeable, talented fitters that can install or restore your wooden floor, giving you peace of mind that everything will meet your specific requirements. 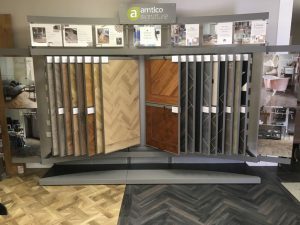 We are now proud to offer Luxury Vinyl Tiles and have a new Amitco Showroom here in Cranage which beautifully complements our new Wood Flooring Showroom. We also have an in-house interior designer who can assist in other elements of your project if required – Meet the team here. With a wealth of experience in the flooring industry, we can make recommendations to you to suit your needs and budget. We can supply and install many types of flooring to both residential and commercial customers. This Includes Hardwood Flooring, Luxury Vinyl Tiles and Laminate Flooring. Ashley has many designs and styles available including Planks, Herringbone, Chevron, Parquet, Basket Weave, Panels, Tiles and many more. We can also offer electric underfloor heating for those wanting a bit more warmth underfoot! Ashley offer a Sanding and Sealing service to restore your existing wooden flooring. We offer a selection of different stains and finishes to help transform your wooden flooring. We encourage you to browse the website to see some of our previous flooring projects as well as view our flooring swatches. If you like what you see then perhaps you might like to visit our showroom to see and feel our flooring samples and discuss your requirements further. If you would like to arrange a free survey or visit our showroom no appointment necessary but always best to call prior to your visit, please call 01606 835153 or if you would prefer you can use the contact form and we will respond to you as soon as possible. Now Stocking Amtico Luxury Vinyl Tile (LVT) click below to see the range we have in stock. Did you know that we have a Showroom with all our wood samples? Feel free to pop in and we can advise you of different wood flooring options depending on your style and budget. By Appointment only on Saturday or Sunday.